In the mid-1970’s the USSR suddenly found themselves faced by a new twin threat in the form of the F-15 Eagle and the F-16 Falcon. In reply to this threat, the USSR introduced the SU-27 Flanker and the MiG-29 Fulcrum, but they were not deployed until the mid-1980’s. The SU-27 Flanker had been designed as a high performance fighter that had fly by wire controls and could carry up to 10 AAM’s. The SU-27 was a highly manoeuvrable and was one of the most imposing fighters ever built. SU32FN two seat specialised plane. The Su-27 is in service not only in Russia and other CIS countries but also in China and Vietnam. China also bought a license for the production of its own Su-27 fighters. 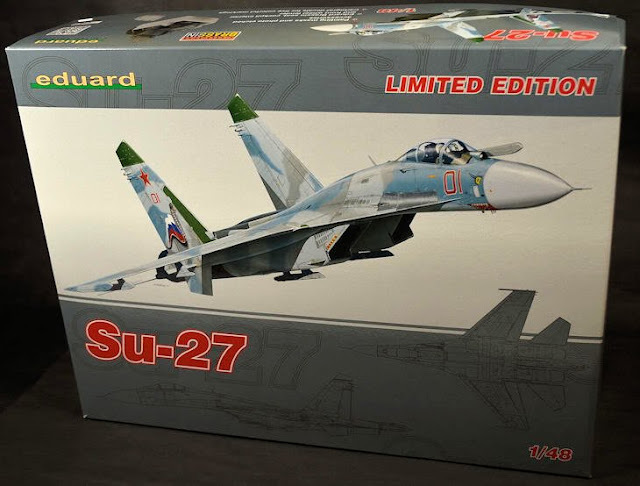 Sukhoi in 1997 signed an estimated $180-million contract with Vietnam to supply six Su-27 (of which two Su-27SK and four Su-27UB)... It is thought that Vietnam plans to buy a total of 24 Sukhoi warplanes for $800 million by the end of the century. 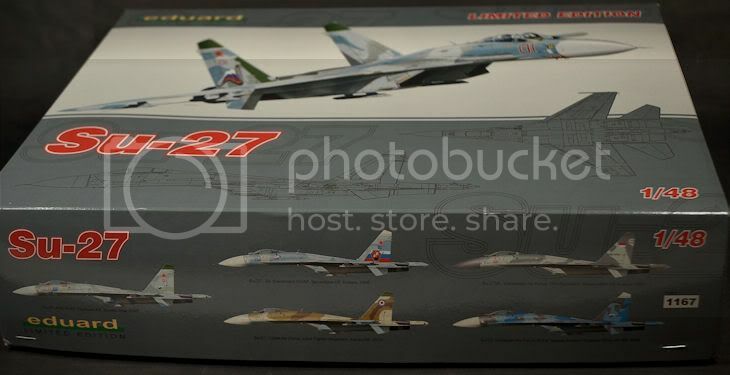 By the end of 1997 Sukhoi had passed all of the blueprints over to license production of the Su-27SK in China, and negotiations on the sale of a further 55 Su-27 fighters to China also began. 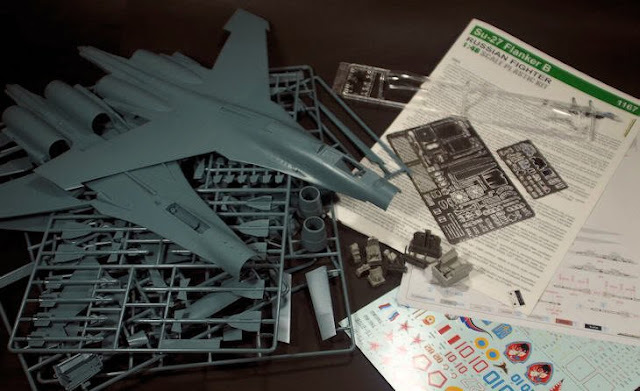 The subject of this build is the Eduard SU-27. This is the old (1990) Academy kit to which Eduard has added a host of resin and photo etched upgrade parts. It is a good thing that Eduard has added as much detail to the kit as the original kit parts are showing their age and detail in many places is either missing or just a mis-shapen lump of plastic. As usual construction starts with the cockpit, and we are aided here by the fact the fuselage is split horizontally. This allows some of the cockpit upgrade parts to be fitted before the fuselage is assembled, something that is an asset when it comes to having all the parts assembled before the initial round of painting begins. The first step is to fill the panel behind the ejection seat. It also allows the photo etched (PE) HUD cover to be fitted as well. This is a great improvement over the kit parts. The best way to deal with non-painted photo etch parts is to anneal them before bending. This makes the PE supple and removes the “spring back” effect that comes with bending most forms of metal. It is imperative to ensure the filler is smooth, otherwise when the PE part is attached it will not sit correctly. The “hump” is replicated by folding the curved part first then attaching the top part. The easiest way to do this is the tack the part in place and bend it around the “hump” as you go. It would have been better to replicate this part in resin rather than PE. As well as the PE for the exterior of the cockpit there is a small resin part to be added to the left hand side of the cockpit. Putting the fuselage aside for the glue to dry, it was time to move on and add detail to the intakes; this is one area where the extra detail really adds to the model as the original Academy kit did not supply anything in this area. 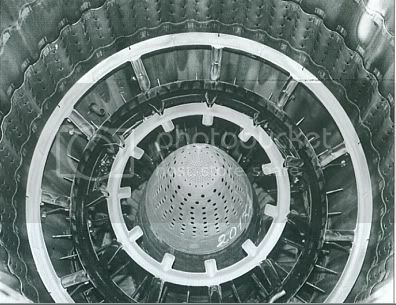 Another area that the Eduard PE radically improves is the vents on the bottom of the intakes. The plastic parts are solid and work in a pinch. However, the Eduard PE parts are a vast improvement. As you can see there is a seam line running down the middle of the intake and this will have to be filled and sanded back. The interior of the exhausts also gets a PE addition in the form of a flame ring. The next stage will include the building of the cockpit area and this is where the Eduard PE really shows its class.